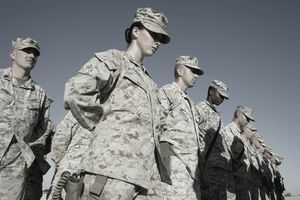 There are several ways to gain a commission in the United States Marine Corps, whether one is currently enlisted or a civilian college student/graduate. For those Marine Officers not attending the U.S. Naval Academy, the road to a commission as a lieutenant in the Corps begins with one of several programs at Officer Candidates School: The Officer Candidates Class, the Platoon Leaders Course, or the Naval Reserve Officer Training Corps. Each course is a screening process, with the mission to motivate, train, evaluate, and screen potential officers. Aviation officer applicants must also take the Navy and Marine Corps Aviation Selection Test Battery. High Moral Character. Applicants convicted of any felony or misdemeanor involving moral turpitude are rejected. History of addiction to any narcotic, illegal drug, or alcohol is disqualifying. A percentage of each class at the U.S. Naval Academy receives a commission in the Marine Corps through a selection process. The academy offers a bachelor of science degree and reserve commission as second lieutenant to graduates. Academy candidates should begin their nomination request during their junior year in high school. Under the officer candidate programs, male and female graduates of an accredited four-year college or university, and graduates of accredited law schools licensed to practice in a state or federal court are eligible for a reserve commission. Upon successful completion of a 10-week screening and evaluation program, candidates are commissioned as second lieutenants in the Marine Corps Reserve. Even though graduates receive a "Reserve" commission, graduation and acceptance of a commission incurs a minimum active duty (full time) service commitment. Upon completion of this program and commissioning, second lieutenants are assigned to The Basic School at Quantico, VA, for 26 weeks of officer training. After completing The Basic School, aviation officers undergo flight instruction for an additional 18 to 24 months, while ground officers attend specialty schools of varying lengths. Ground officers have an active duty obligation of three and one-half years after commissioning. Pilots have an active duty obligation of six years if trained as a helicopter or fixed-wing turboprop aircraft pilot and eight years if trained as a jet pilot. Naval flight officers (NFOs) have an active duty obligation of six years. Aviation candidates must be at least 20 years old upon entering the program and no older than 27 upon commissioning. Ground officers must be less than 28 years old upon commissioning. Marine Platoon Leaders Class is available to full-time enrolled, physically qualified male and female undergraduate freshmen, sophomores, and juniors attending accredited colleges. Pre-commissioning training consists of two six-week sessions or one 10-week session during summer breaks at the Marine Corps Combat Development Command in Quantico, VA.
PLC students may choose ground, aviation, or law contracts, and may apply for financial subsistence allowance of $250 a month upon completion of one summer training session. Aviation students may join the Flight Indoctrination Program and receive civilian flight instruction during their senior year of college. PLC members may also apply for the Marine Corps Tuition Assistance Program and receive as much as $5,200 per year for tuition assistance. Upon graduation from college, PLC participants receive reserve commissions as second lieutenants. Officers are then assigned to The Basic School at Quantico, VA for 26 weeks of basic officer training. Students opting for ground or law training must be at least 17 years old upon entering the program and less than 28 upon commissioning. Pilot candidates must be at least 17 upon entering the program and less than 27 upon commissioning. Aviation may be guaranteed to freshmen if qualified. Minimum active duty obligation for ground officers and lawyers following commissioning is three and one-half years. Following flight training and designation as a naval aviator, the minimum active duty obligation is six years if trained as a helicopter pilot or naval flight officer and eight years if trained as a fixed-wing pilot. Minimum active duty requirements are extended six months for receiving financial subsistence allowance and 18 months for receiving tuition assistance. Navy/Marine Corps ROTC programs at more than 65 colleges and universities across the country offer Marine Corps commissions to college students who complete four years of naval science study on campus. The two types of programs are the College Program and the Scholarship Program. In addition to students already enrolled in college programs, or planning to attend college, some enlisted personnel are eligible to apply for a Navy/Marine Corps ROTC Scholarship. Four-year scholarship program. Students are selected from a national competition and are appointed midshipmen, U.S. Naval Reserve, and identified as Marine Corps options. They may be granted the compensation and benefits authorized by law during the Basic Course for a total period of not more than four years. During this period of college, the Department of the Navy pays tuition, fees, and textbooks, and provides uniforms and a subsistence allowance of up to $400 for each academic month. Upon completion of naval science requirements and graduation, students receive reserve commissions as a second lieutenant with a four-year active duty obligation. Four-year college program. Students are selected from among those applying for enrollment at each Navy/Marine Corps ROTC unit. During the first two years in the Basic Course, students have the status of civilians who have entered into a contract with the Navy. Upon completion of one term of The Basic Course, students may apply for a change to a Marine Corps option. Upon enrollment in the Advanced Course, College Program students enlist in the Marine Corps Reserve. Upon graduation and completion of naval science requirements, students are commissioned as second lieutenants in the Marine Corps Reserve with a three-and-one-half-year active duty obligation. The Navy provides uniforms, naval science textbooks, and up to $400 for each academic month for a maximum of 20 months during the Advanced Course. Three-, two-, and one-year scholarships are available to College Program students nominated by their NROTC unit commanding officers. The Commandant of the Marine Corps makes those selections. Two-year scholarship and college programs. Students selected are those with advanced college standing who qualify for enrollment in the Advanced Course. They must first complete the six-week course at the Naval Science Institute. Those enrolled in the two-year scholarship and college programs have the same privileges and obligations as those in the respective four-year programs. The U.S. Naval Academy Preparatory School. The Preparatory School, located at Newport, RI, accepts applications from active duty and inactive reserve enlisted members of the Marine Corps. The Naval Academy admissions board considers applicants for the Naval Academy Preparatory School. The application is made to the Naval Academy. If someone is not selected for admission to the academy, they could be selected for the Naval Academy Preparatory School. Entrance requirements are based on the whole person evaluation of overall abilities and potential, and are similar to those of other prep schools. Broadened Opportunity for Officer Selection and Training (BOOST). BOOST offers active duty enlisted men and women between the ages of 18 and 24 the opportunity to receive 10 months of extensive academic preparation to become more competitive for selection to the Naval Academy, Marine Corps Enlisted Commissioning Education Program and Navy/Marine Corps ROTC scholarship programs. BOOST participants attend school at the Naval Education Training Center in Newport, RI, If not selected for either a Navy/Marine Corps ROTC scholarship, MECEP, or appointment to the Naval Academy, BOOST students fulfill their service obligation to the Marine Corps in the enlisted ranks. Enlisted Commissioning Program (ECP). ECP provides enlisted Marines with a four-year degree from an accredited school the opportunity to become commissioned officers. ECP is open to Marines with a minimum of one year active duty experience and at least 12 months remaining on their current enlistment contract. This program provides selected enlisted Marines, ages 20 to 26, with an opportunity to earn a baccalaureate degree by attending a college or university full-time. After obtaining a degree and completing officer candidate school, MECEP graduates are commissioned as reserve second lieutenants, provided they are no older than 30. Meritorious Commissioning Program. MCP provides a commissioning opportunity for enlisted Marines with two-year degrees, 75 semester hours or more of college work, which have demonstrated rare leadership qualities, and would ultimately better serve the Marine Corps as an officer. Unlike other commissioning programs where the applicant initiates the application process, MCP requires that applicants be nominated by their commanding officers. Marines must have the same basic qualifications for MCP as ECP. Marines are given a reserve commission and serve on active duty. What Are Your Officer Career Options Within the US Marine Corps?